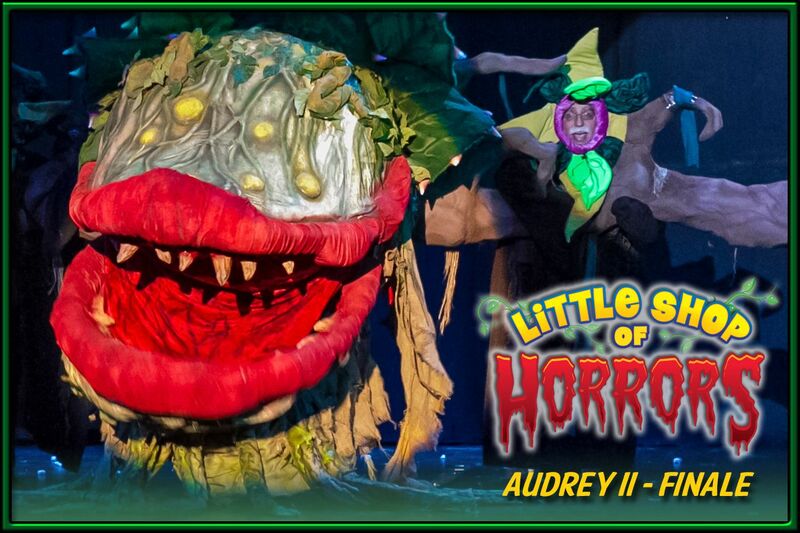 From innocent little plant to ferocious man-eating monster from outer space, Audrey II is the largest star on any stage... proving "Bigger is Better"! 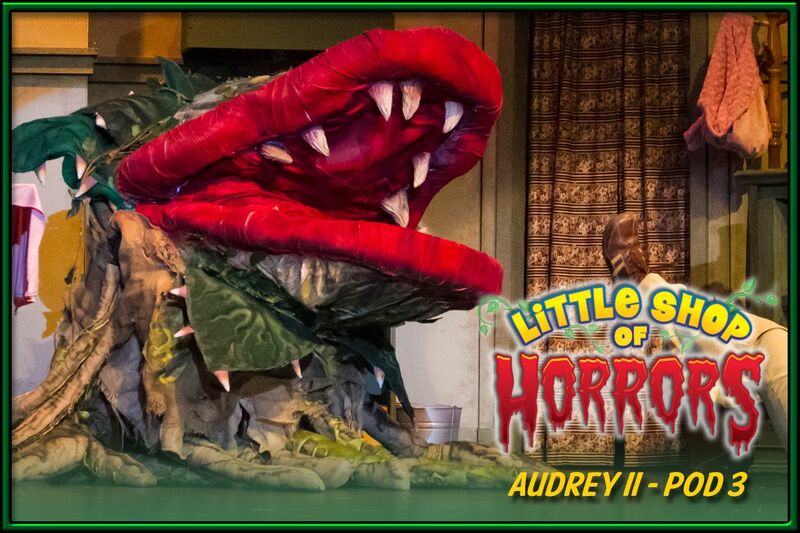 When first seen, poor little Audrey II is on her last legs. Presumably when Seymour bought the plant, she was in a healthier state but that was weeks ago. Physically she is small, her pod pale and her lips subtly curved, hiding small sharp teeth. Hidden within the sickly exterior are new leaves and vine that are revealed when the plant grows. Pod 2 is about 4 times the size of Pod 1 and is operated entirely by Seymour who carries the plant in his arms during the entire scene. This is the old “fake arm” trick. Seymour’s right hand is actually inside the pot operating the plant’s mouth and trunk. On the outside is seen a realistic looking arm and hand holding the pot. The operation of this plant is very much like a ventriloquist act. The success is how completely the actor playing Seymour can divide the plant’s movement from his own, making the pod its own character. Pod 3 is much more complex than Pod 1 and Pod 2. 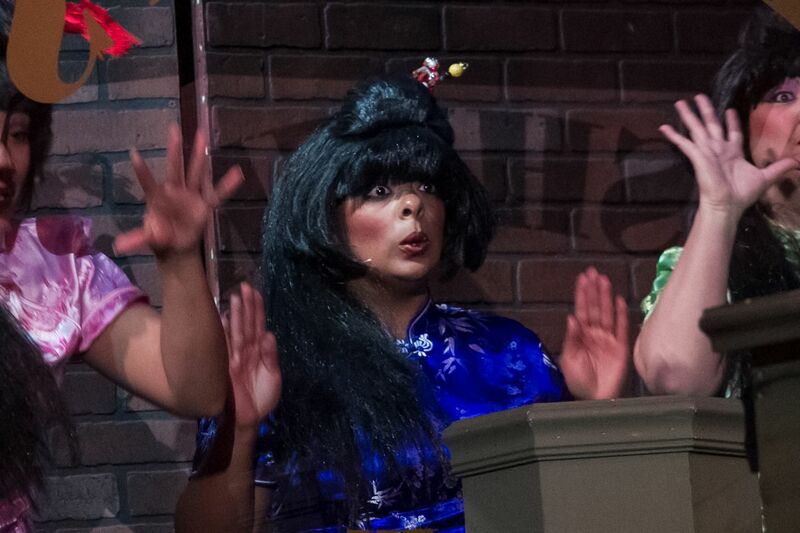 She spends a large portion of her first scene in an upright immobile state but when the time is ripe, she reveals her ability to talk and sing. She uses Seymour’s surprise to throw him off-balance while her point is nailed home: Mere drops of blood won’t do anymore! She demands, cajoles, bribes and seduces Seymour into a course of action required for her life and future plans. Inside Pod 3, the puppeteer’s entire body is involved. The head and chest of the puppeteer operates the upper jaw while the puppeteer’s arms and hands operate the lower jaw. The legs are covered with root pants which allow even more animation by kicking. The puppeteer sits on a stool that is placed inside the large pot provided. Pod 4 is the largest of the puppets. The trick is to operate the puppet just behind the center of balance of the plant. Inside, 4 bongie cords are attached to a backplate, which rests on the puppeteer’s back, providing a sturdy and accurate floating balance. The weight counter balances to the rear, allowing the puppeteer to manage the remaining front weight of the lip synch. 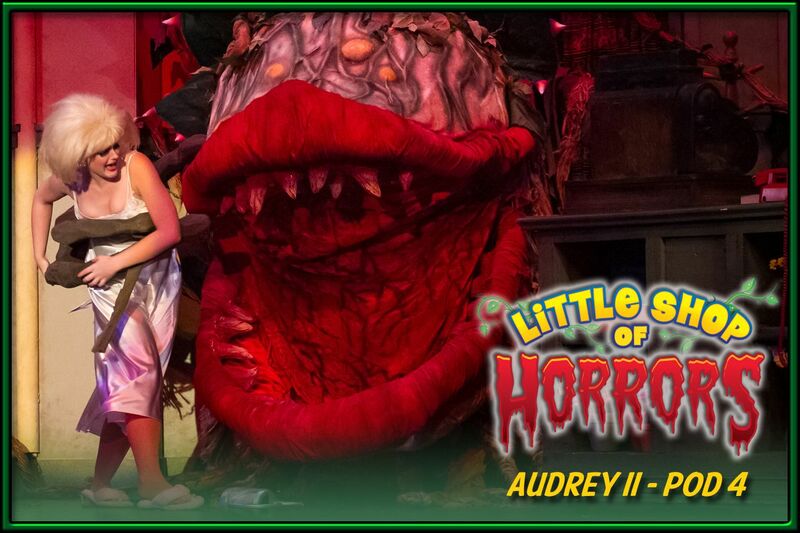 At this stage of growth, Audrey II has a great deal of personal power and is showing a marked control of events around her. She still must play the game properly and not scare off Seymour until it is too late. She sits in the shop like a fat, egotistical potentate, biding her time until she is in charge of her own destiny and procreation. Big and strong as she is, she doesn’t display real violence until she devours Mr. Mushnik whole. In the finale', we see the plant in all its terrifying glory: completely powerful and in total control. 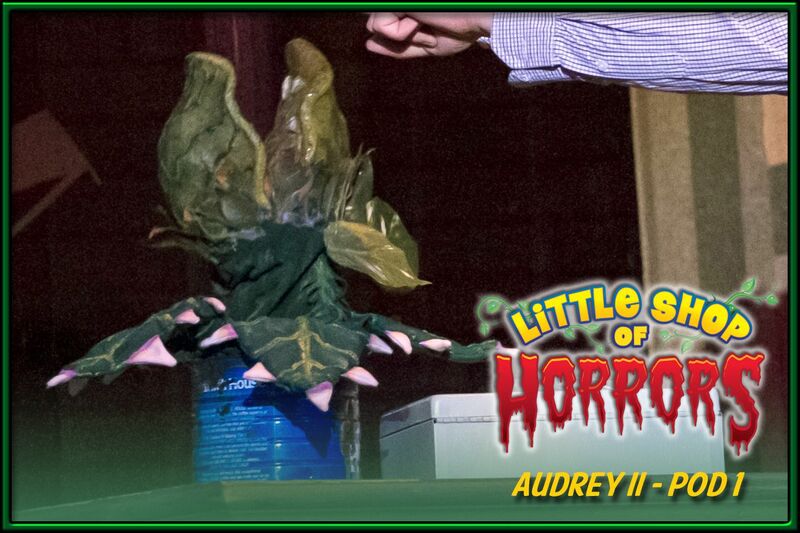 ImaginationWorks' Audrey II rental package also comes with all the necessary pieces to stage the finale', "Don't Feed The Plants"! 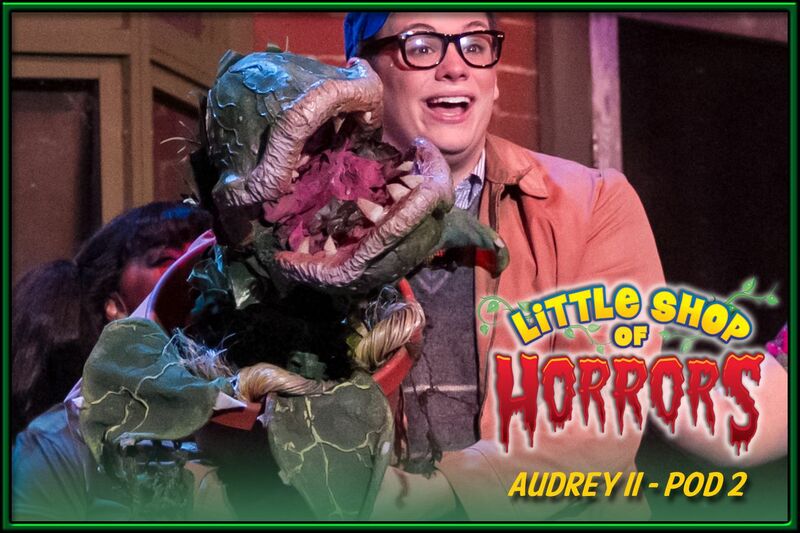 Worry no more about those "hard to find" pieces for your production of "Little Shop of Horrors". 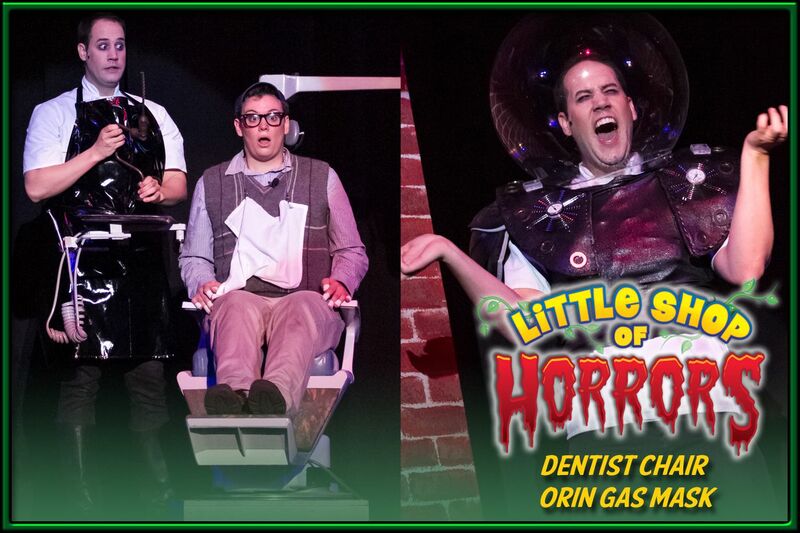 Orin's dentist chair and gas mask are now available to rent as extra accessrories for a successful production! Separate props contract and additional fees required.